Coolmark Mechanical is a York Region HVAC contractor that specializes in designing, building, and servicing refrigerated space for food industry clients across the GTA. Based in Woodbridge, Coolmark has carried on a 15-year commitment to training apprentices since its founding in 1996 by Claudio Gulli, president of the company. Coolmark turned to apprenticesearch.com when it was time to hire new apprentices this year. Claudio’s foreman, Joe D’Ambrosio found the website through an internet search and posted an apprenticeship opportunity. 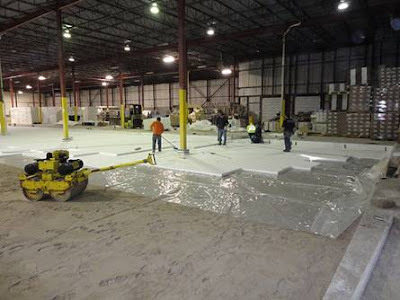 In a very short time, the company had hired two apprentices off the site. “Both guys have worked out well for us,” said Claudio. “They ask questions and are good listeners. They come to work with respectful attitudes and learn well. We’re glad we found them.” Both apprentices will be receiving the in-class portion of their training at the United Association HVAC and Refrigeration Pipefitters Local Union 787 in Brampton. Coolmark is one of those companies that stays busy year round. “The food business isn’t really seasonal,” said Claudio, “people always have to eat.” And as long as this company continues to satisfy its many commercial customers, the referrals and the additional work will keep on coming. Tina Hart’s career path changed dramatically over a four year period. First she discovered the one kind of work that most interested and motivated her – stone masonry. Then she pursued her new passion from apprenticeship training to Red Seal certification. And finally she established her own business – Galt Stone Masonry – and became her own boss – all in less than four years time! In December 2007, Tina registered on www.apprenticesearch.com in the hopes of finding work. Her landscape design program at the University of Guelph had exposed her to stone cutting and stonework, and she wanted to learn more about this type of work as an apprentice. Within days, she was hired by Old World Stone in Burlington, and found very quickly that stone restoration and masonry was highly interesting and satisfying work. Tina completed the in-class portions of her apprenticeship at the Ontario Masonry Training Centre in Mississauga and went on to achieve Red Seal certification within three years. 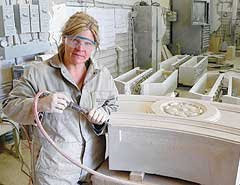 Recently Tina set off in a new direction, establishing her own business, Galt Stone Masonry (www.harttstone.com). Specializing in the use of natural stone to restore historical buildings or to install new masonry, her company prides itself on superior craftsmanship and high quality service at affordable prices. Projects of special note include the re-pointing of two 125 year-old Rubble Stone Granite homes in Cambridge and the creation of castable refractory pizza ovens able to withstand temperatures up to 2,300 degrees. Hopefully the future success of Galt Stone Masonry will be equally amazing. If new projects and referrals bring enough business for Tina to expand, she hopes to hire an apprentice herself. “It will be good to give something back and let someone else experience some of the satisfaction and joy I have found in this work,” she said. The first Canadian Tire store was founded in Toronto in 1922. In 1934, twelve years later, Canadian Tire opened its first store on Ottawa Street in Hamilton. Now there are over 482 stores across Canada employing more than 58,000 employees. The majority of the stores operate in distinct categories of auto parts, auto service, tools, hardware, sporting goods, houseware and seasonal items. I spoke to David Rodgers, Service Manager of the Upper Gage location, established in 1982, to get his views on our website “apprenticesearch.com”. He heard about the website about a year ago through an employment job bank. “It’s a great website, why go anywhere else to post a job opportunity when this website is FREE and provides great service and has qualified applicants looking to get started in the skilled trades”, he said. David has hired five people from our site, some getting started in the auto trade and others as signed apprentices. Over the years, David has helped many students decide if this is the career for them by taking on co-op students from nearby high schools. When I asked him what feature he liked best about the site he said “Once your posting has been approved it’s great how fast the applicants start applying to the posting”. “I receive their resumes by email and I can look them over to see if they have the qualifications I’m looking for and call them right away for an interview”. I also spoke to Erin Cannon, who was recently hired there through our website as a second year Automotive Service Technician Apprentice. Erin took co-op in high school and knew then that the auto trade was the career she wanted to pursue. - Hamilton Training Advisory Board’s “TECH: Technology and Trades for Women”. Erin heard about our website while attending this event at the Hamilton Convention Centre. 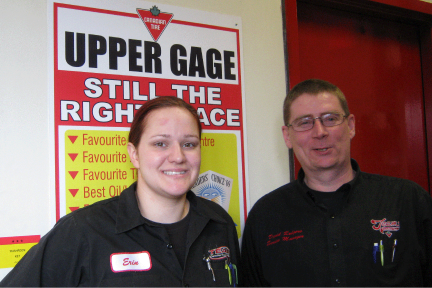 Erin is enjoying learning new skills at this location of Canadian Tire store and is working towards completing her apprenticeship. Good luck and all the best Erin!